Alaia is chic and convenient! The decor is very minimalist and modern, and the villa is just a short walk from the beach and a few minutes from town. I love how the master bedroom has an extra single bed in case younger kids want to sleep in the same room as their parents. 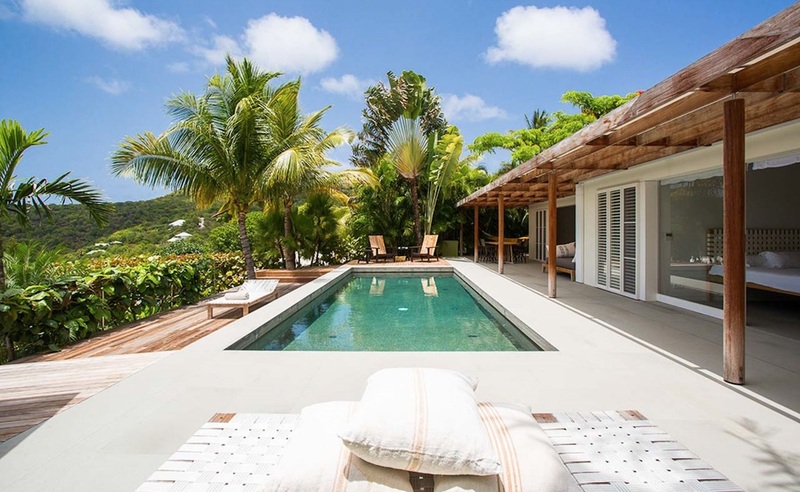 Villa Alaia is a contemporary 3-bedroom villa within walking distance of St. Jean beach. Alaia is also near shops and restaurants, so there’s something for every guest to enjoy. The pool deck has ample lounging spaces around the medium-sized pool. Outdoor dining, a hammock, and an outdoor living area are all under the covered pavilion. The outdoor dining area seats has a separate grilling station next to the house. The main house can be completely closed off and air-conditioned, or open to the breeze. The living room has comfortable seating, an entertainment center, U.S. satellite TV, and a Sonos sound system. The dining room opens to the covered terrace, so guests can feast indoors or outdoors. The spacious living and dining area opens to part of the kitchen. The cooking and washing section of the kitchen sits in an alcove on the far side of the space. Guests can access the master suite from the living room. This bedroom has a dressing room, ensuite bath, and king-sized bed. There’s a small office with a built in single bed, perfect for a child. The second bedroom is in a bungalow next to the pool area, with a queen-sized bed and ensuite bath. The third bedroom is on the lower level, and has its own terrace and small kitchenette. This villa is ideal for a family vacation or group getaway. It’s convenient location and well-sized rooms offer guests total relaxation. Master Bedroom : Main Level; Office with single bed for a young child. Walk to St. Jean beach. Free rental car with villa rental between 4/15/2019 and 12/15/2019. - Car is a category A from "Welcome Car"